Reading lists and I are like the Supreme Court and the Constitution (here), so any organization that takes me around meeting amazing folks and sharing wonderful things and analysis about Guatemala, AND puts together a reading list on the country, gets lots of brownie points from me. Said organization is CEDEPCA- Protestant Center for Pastoral Studies in Central America, based out of Guatemala City. 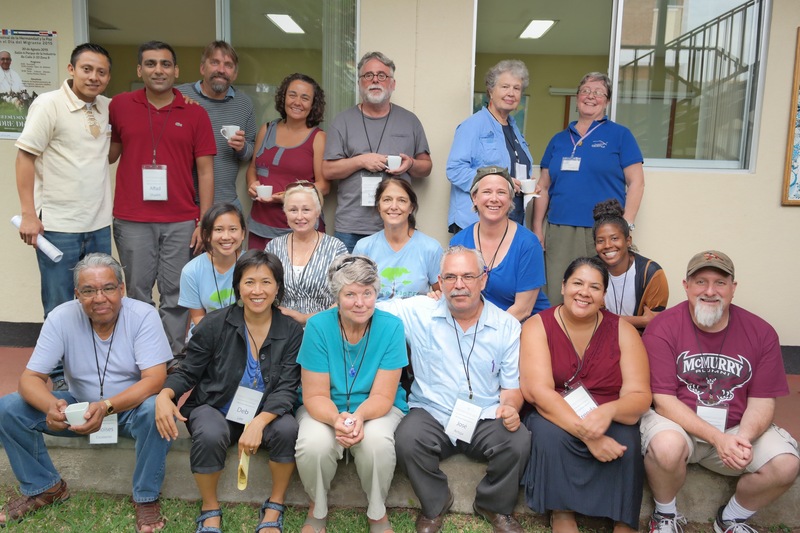 CEDEPCA strives to connect individuals and faith communities in the United States to the mission of CEDEPCA in Central America, through education, networking, fundraising and accompaniment. What is there mission? Well check out there website here and below is a pretty lengthy reading list, a Guatemala Primer of sorts for you to check out before your visit to Guatemala! There are some books on the CEDEPCA list that can be found on the Root Causes of Migration People of Faith (picture above at the Guatemala City CEDEPCA office) reading list I put together earlier in my trip, check it out here. The Guatemala Reader: History, Culture, Politics (The Latin America Readers) by Greg Grandin, Deborah T. Levenson and Elizabeth Oglesby. Duke University Press, 2011. Shattered Hope: The Guatemalan Revolution and the United States, 1944-1954. Piero Gleijeses. Princeton University Press, 1991. Bitter Fruit: The Untold Story of the American Coup in Guatemala. Stephen Kinzer & Stephen Schlesinger, Doubleday, 1982, 255 pp. Details the 1954 coup which involved the CIA and the United Fruit Company; very helpful for understanding the current reality. I, Rigoberta Menchu (An Indian Woman in Guatemala). Rigoberta Menchú, Ed. Burgos-Debray, Thetford Press Ltd., 1984, 247 pp. Autobiography of the 1992 Nobel Peace Laureate. Stubborn Hope: Religion, Politics, and Revolution in Central America. Phillip Berryman, Orbis Books, 1994, 244 pp. — A comprehensive analysis of the dynamic interplay between religion and politics in Guatemala, Nicaragua, and El Salvador. Silence on the Mountain: Stories of Terror, Betrayal, and Forgetting in Guatemala. Daniel Wilkinson. Houghton Mifflin, 2002. Re-Enchanting the World: Maya Protestantism in the Guatemalan Highlands. C. Mathews Samson. Tuscaloosa: University of Alabama Press, 2007. The Art of Political Murder: Who Killed the Bishop? by Francisco Goldman. Bishop Juan Gerardi, Guatemala’s leading human rights activist, was bludgeoned to death in his garage on a Sunday night in 1998, two days after the presentation of a groundbreaking church-sponsored report implicating the military in the murders and disappearances of some two hundred thousand civilians. Realizing that it could not rely on police investigators or the legal system to solve the murder, the church formed its own investigative team, a group of secular young men in their twenties who called themselves Los Intocables (the Untouchables). Known in Guatemala as “The Crime of the Century,” the Bishop Gerardi murder case, with its unexpectedly outlandish scenarios and sensational developments, confounded observers and generated extraordinary controversy. In his first nonfiction book, acclaimed novelist Francisco Goldman has spoken to witnesses no other reporter has reached, and observed firsthand some of the most crucial developments in the case. Now he has produced The Art of Political Murder, a tense and astonishing true detective story that opens a window on the new Latin American reality of mara youth gangs and organized crime, and tells the story of a remarkable group of engaging, courageous young people, and of their remarkable fight for justice. 2008. Gift of the Devil: A History of Guatemala. Jim Handy, South End Press, 1984, 319 pp. Very readable. What Prize Awaits Us: Letters From Guatemala Berniece Kita, Orbis, 1988, 213 pp. Through her letters, a North American nun shares what it was like to live in an isolated Mayan village from 1977-1983 through some of Guatemala’s worst years. Threatened with Resurrection: Prayers & Poems from an Exiled Guatemalan. Julia Esquivel, Brethren Press, Elgin, IL, 1982. The Certainty of Spring: Poems by a Guatemalan in Exile. Julia Esquivel, EPICA, Wash, DC, 1983. Robbed of Humanity, Lives of Guatemalan Street Children. Nancy Leigh Tierney, Pangaea Press, St. Paul, Minnesota, 1997. Love in a Fearful Land, A Guatemalan Story. Henri Nouwen. 1985. True story of two priests in Santiago Atitlán. The Grandaughters of Ixmucané; Guatemalan Women Speak. Emilie Smith-Ayala, Women’s Press, Toronto, 1991. Interviews with Guatemalan women, many of whom are still visible in public life in 2000. America’s Watch for Human Rights Annual Report on Guatemala. A Beauty that Hurts: Life and Death in Guatemala. Lovell, W. George. Between the Lines, Toronto, Canada, 1995. Conquest and Survival in Colonial Guatemala: A Historical Geography of the Cuchumatan Highlands. Lovel, George. McGill-Queen’s University Press; Kingston, ON Canada, 1992. The Wounds of Manuel Saquic: Biblical Reflections from Guatemala. Manley, Jim. United Church Publishing House; Ontario, Canada. 1997. Bridge of Courage- Life Stories of the Guatemalan Compañeros & Compañeras Harbury, Jennifer. Common Courage Press; Monroe, Maine. 1995. Guatemalan Women Speak. Hooks, Margaret. EPICA; Washington, DC. 1993. The Long Night of the White Chickens. Goldman, Francisco. Grove Press, New York. 1992. The Risk of Returning. Rudy and Shirley Nelson 2014.